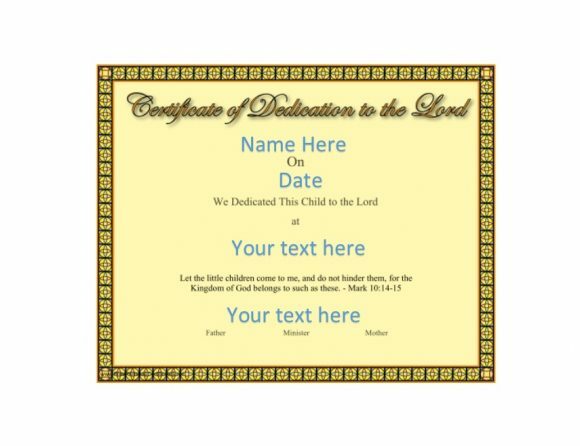 The roots of baby dedication certificates are on one’s Christian values. It defines memorable details of the child’s dedication to the church and to God by his parents. It’s also an acceptance by the parents that the church will be a safe and conducive place. Here, the child can learn many facts about life. 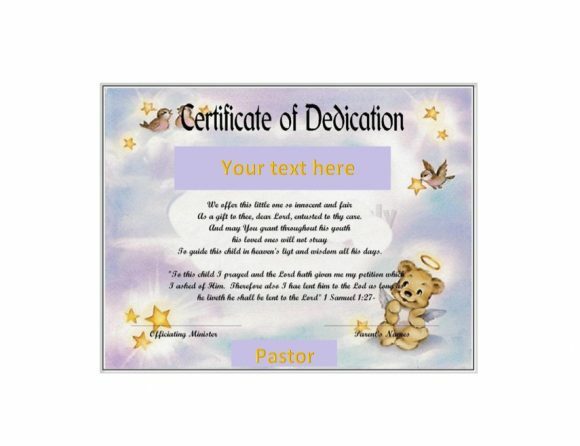 Baby dedication certificates are mementos that families, especially the parents, will cherish. 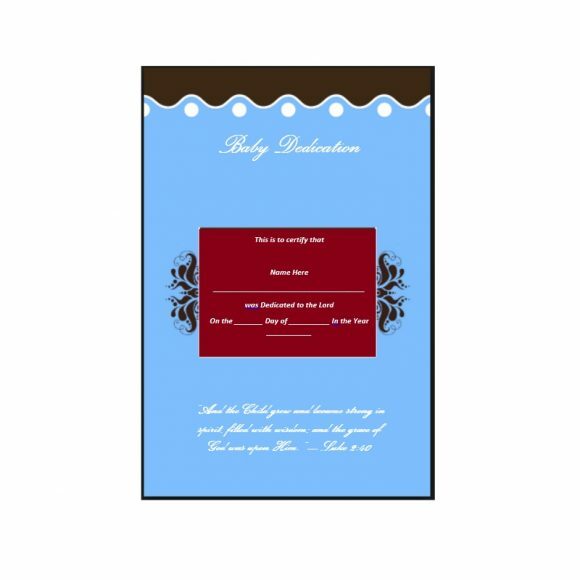 2 What is baby dedication? 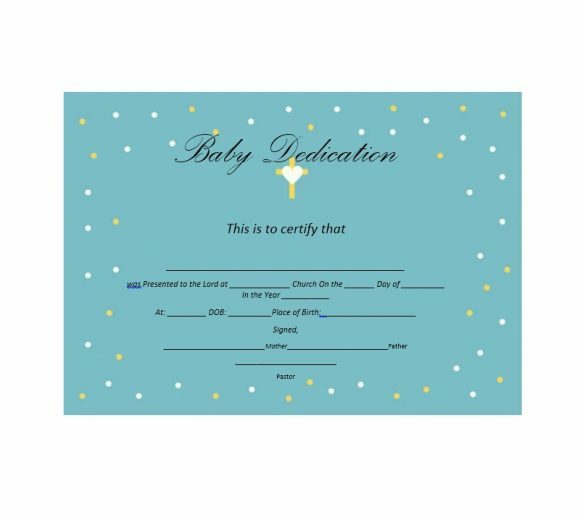 5 Who should have baby dedication? 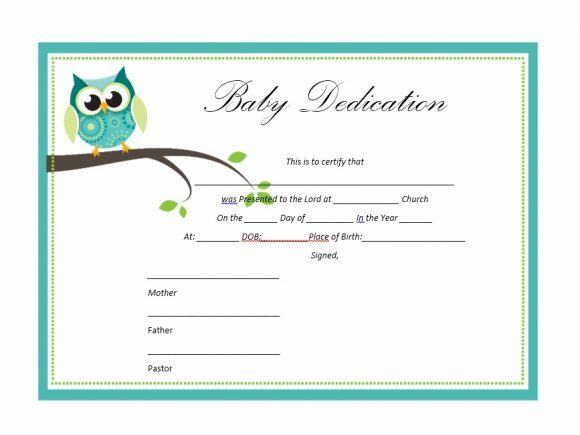 7 How is baby dedication different from baptism? Under the guidance of parents the child grows closer to the Lord, the religious head of the community. Some pastors even write short notes like a prayer or a Biblical verse. 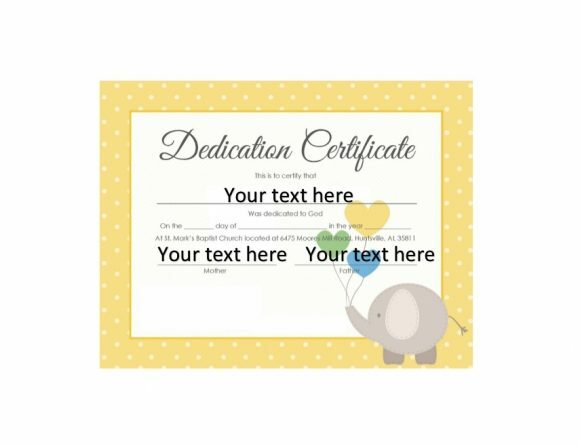 It enhances the certificate’s purpose. These notes will have much more meaning for the child in later years. 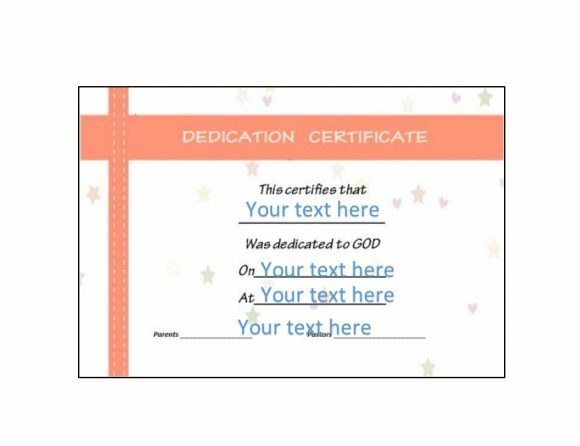 Certificates are typically designed simply but beautifully. Colors used are usually light and are appealing to the sight. They usually have fancy borders. 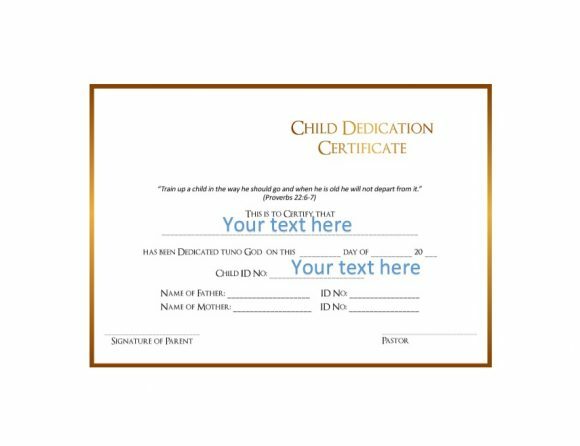 Fill out the information about your child’s dedication to the document. 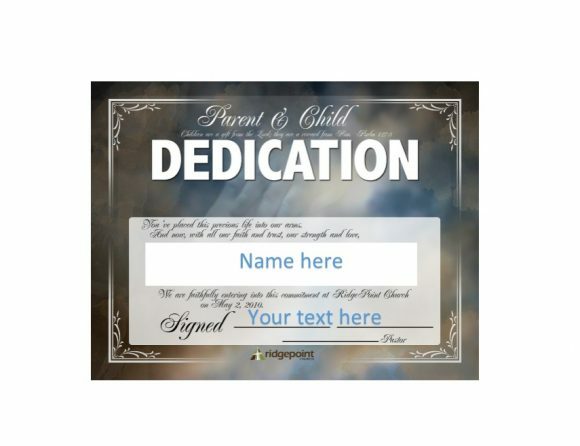 This includes your child’s name, the church’s name, and the date of determination. In addition are the parents and the church leaders’ names and signatures. The arrival of a new member of a family is always an exciting moment. In Christian communities, the pastor has the honor of sharing parents. 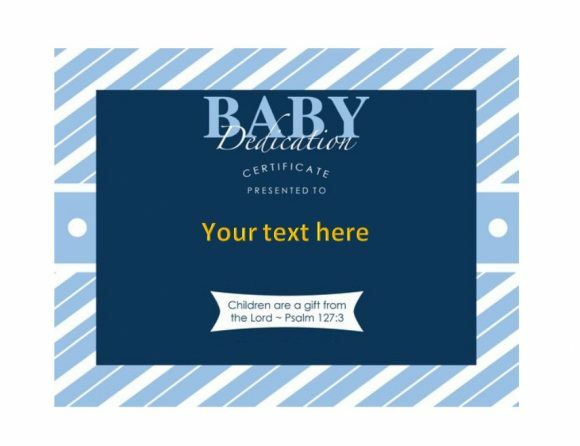 Through a baby dedication, they can show how much they appreciate God. 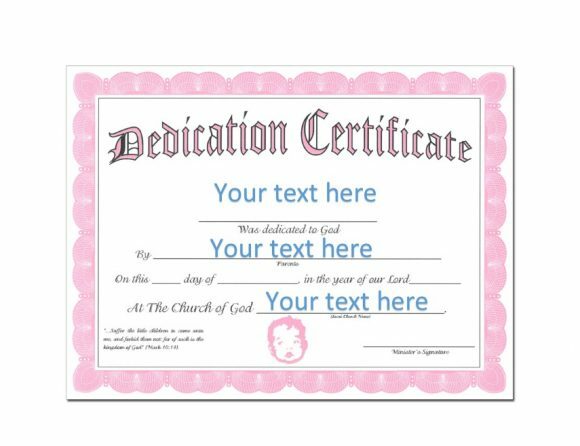 Baby dedications involve a ritual. 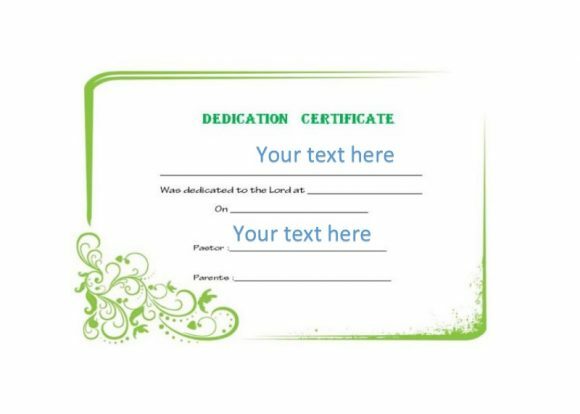 As per it, parents are believers that make a pledge before God. They submit their child to Him and raise the child in the ways and words of God. The feeling that the child is the Lord’s gift to doting parents should be a great moment in their lives. The certificate will give credence to this priceless memory. 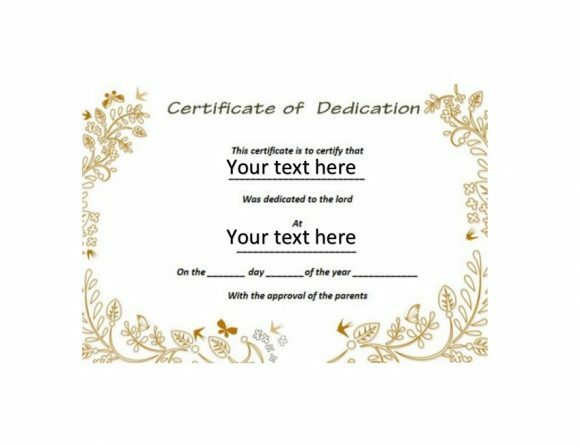 When parents dedicate their children to the Lord, they’re making a vow. They would do everything in their power to see to that they raise their child in the ways of the Lord. To teach and train the child using God’s word. To demonstrate examples of Godliness. To discipline according to God’s word. To pray intently for the child. There is no better act of gratitude than to dedicate one’s child to God. In such an act, you are acknowledging that your child is the most awesome blessing. 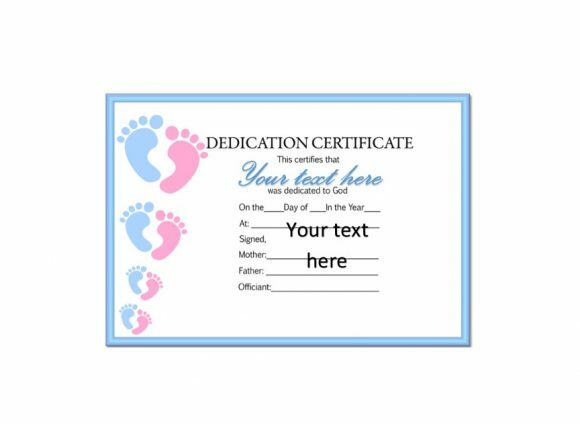 God has bestowed upon you and that you are just reciprocating by dedicating the child back to Him. Think about it, the child came from Him and belongs to Him anyway. We all do. The child is God’s gift to us and we as parents serve as their wards. God entrusted them to us and it is but logical that we raise them to love and serve Him. That in itself is a big challenge. 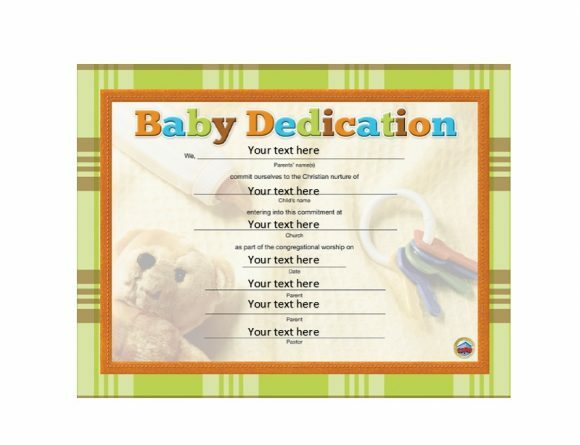 It is a responsibility that we can start by dedicating your child to the Lord first. 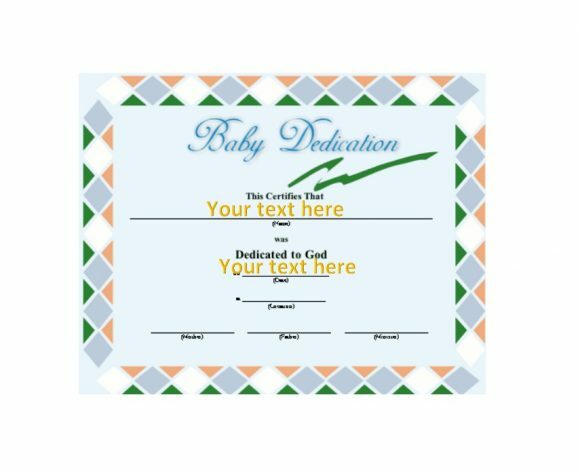 Baby dedications are voluntary acts, they aren’t forced. It is a rite where Christian parents commit their children and themselves to the service of God. Teaching the child God’s ways and raising them according to God’s word. Trust God completely according to His purposes, is an outward expression of commitment. 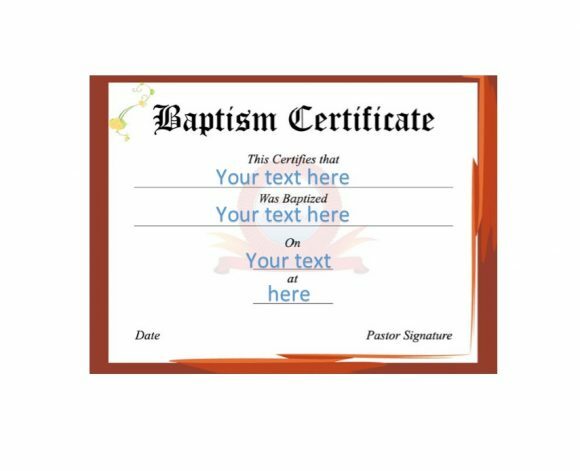 This should not be mistaken for baptism nor will it replace the rite. What the child will want in later years will be his own decision. At this point, parents can only hope that through their guidance and teachings. The child will grow to personally accept Jesus as Lord and Savior. When he does, the next step of faith will be baptism by water. Present the child with dedication to God. It is like confessing and putting your faith in Jesus Christ as Lord and Savior. 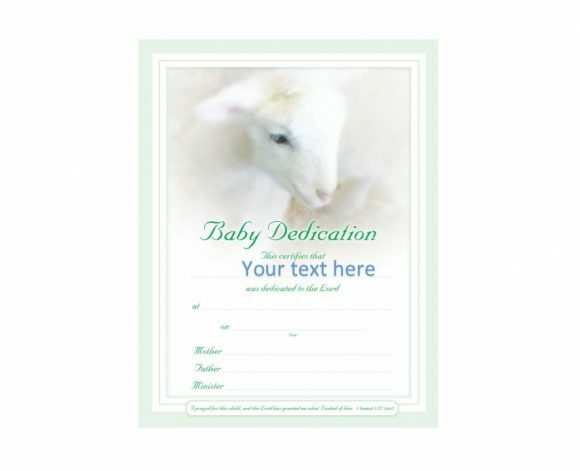 And when it’s done, you’ll get a baby dedication certificate template. It reminds of the occasion. It will then be the parent’s obligation to rear their child in the fear and admonition of the Lord. 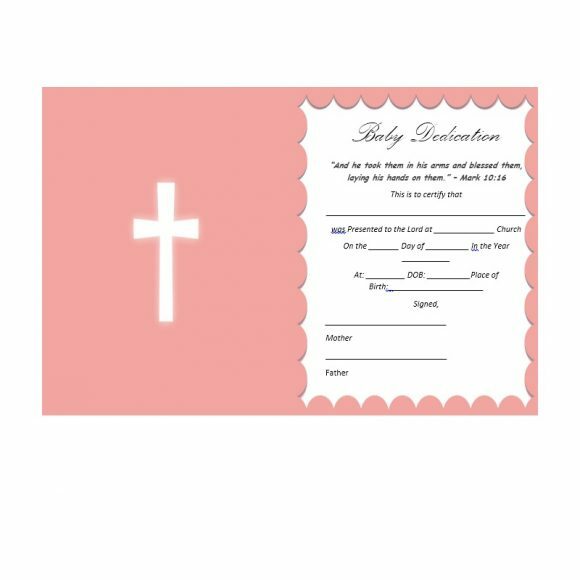 Who should have baby dedication? Parents should dedicate themselves and their children to God. They should believe in His Good News. God has extended his invitation that they are part of His family, His Kingdom, and His mission. They should believe that Jesus lived then died in payment for our sins. They should believe that Jesus rose from the dead so they too can have new life. They should believe that God loves all of them and that such love is free. They should not be Christians only in name but also by heart with a truly personal and committed faith. Parents could be very committed members or people while becoming members. Either group should take the responsibility. It involves raising their children with a firm spiritual foundation. Parents should show they’re committed to letting their children attend church services. Also, you should make certain that God becomes a part of their day-to-day lives. 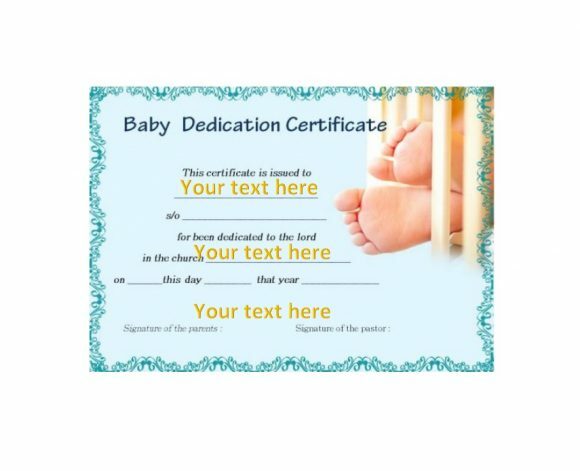 Before receiving a certificate for child’s baby dedication think about its wordings carefully. Also, make sure you have the commitment. 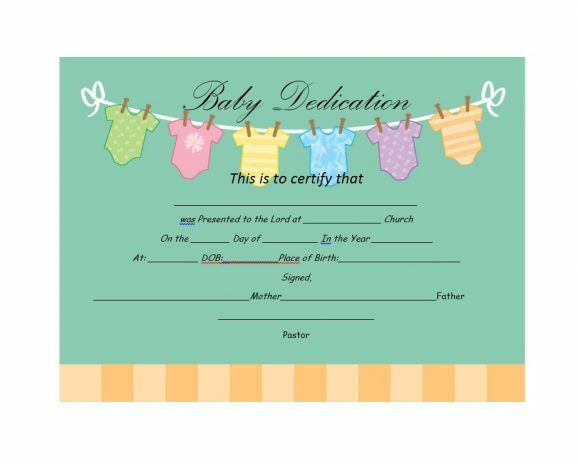 Baby dedication is symbolic and it comes with responsibilities. 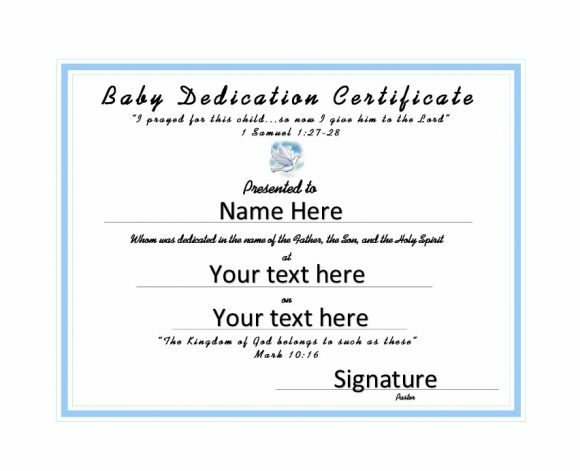 How is baby dedication different from baptism? 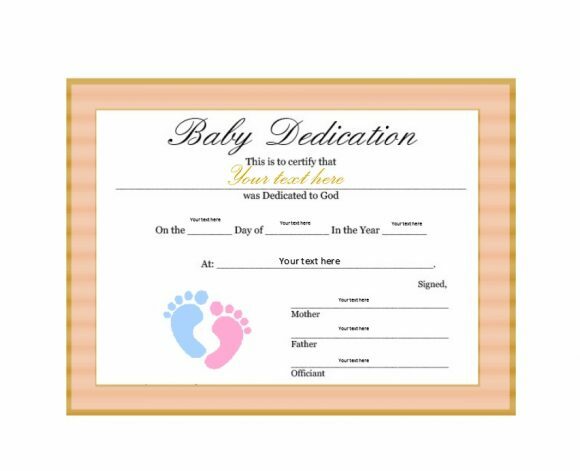 Baby dedication ceremonies are different from Baptism rites as practiced by Christian religions. 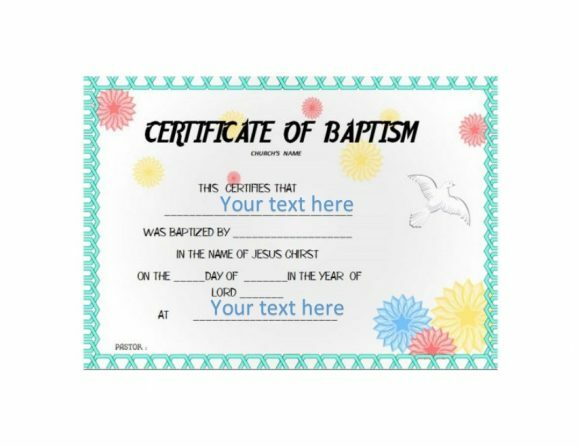 When a child gets baptized, that secures his/her salvation. Because of original sin, the church believes that infants are sinners. By logic, a child who wasn’t baptized will suffer in hell, if he/she dies. 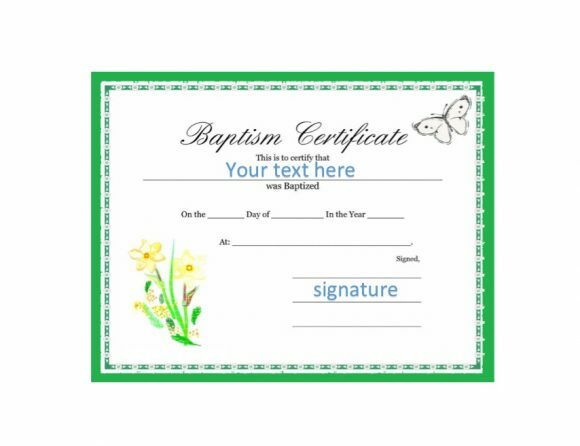 The rite of baptism gives the grace a child needs to save him. It erases the original sin and saves the child from the fires of hell. 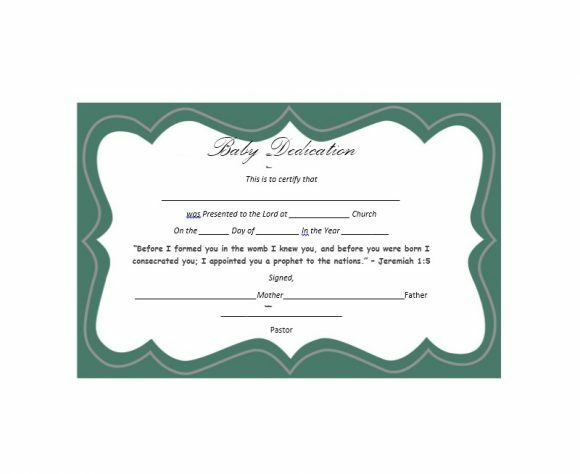 Baby dedications are nothing like baptisms. Scriptures tell us that people aren’t condemned to damnation because they were born. Each of us has a free will which they can use to make choices, either right or wrong. This will be the basis for God’s judgment. But of course, you need to be mature or old enough to differentiate between what is good or bad. Infants are in no position to choose. It is here where parent’s guidance and teachings become apparent. By teaching the child to make the right choices as they grow and that the choices should be for God and His grace. This is an effective way for children to realize this. The godly parents are responsible. They live faithful lifestyles and dedicated to children in keeping the grace of God. 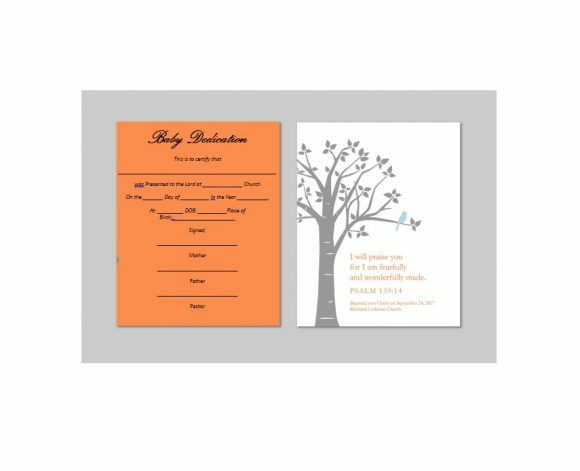 For parents, families, friends, a baby dedication is a memorable and beautiful occasion. They let you share dreams and hopes. 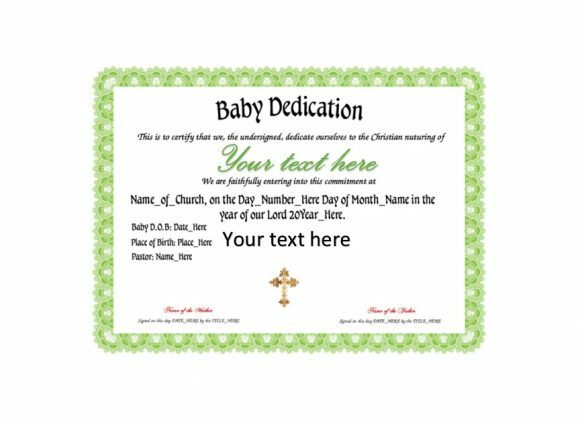 To make the occasion more unforgettable, churches will present a baby dedication certificate. The person you choose can either be a minister, an elder, special friend. You can even conduct the ceremony without a celebrant. In such case, the parents usually assume the position. 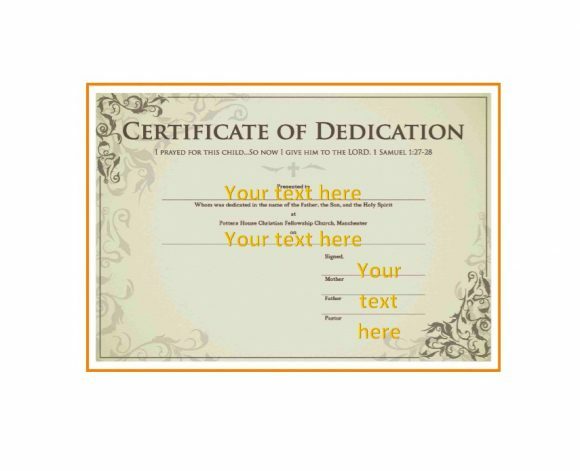 On the certificate, include a space for the celebrant to affix his/her signature. 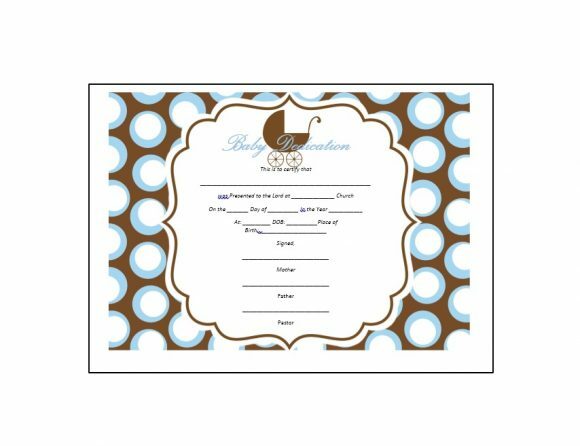 Include your names as the parents along with the name of your baby. 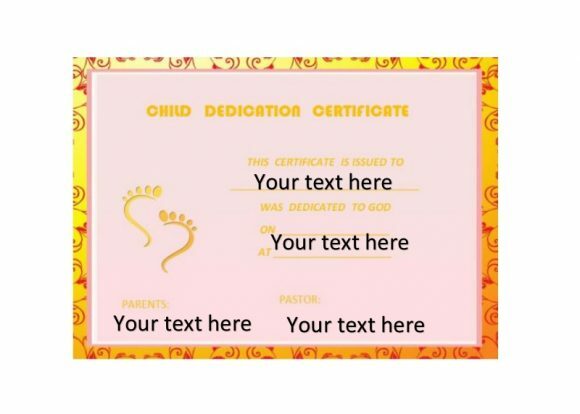 Do not forget to include the parents’ names in the certificate. That is but logical of course. 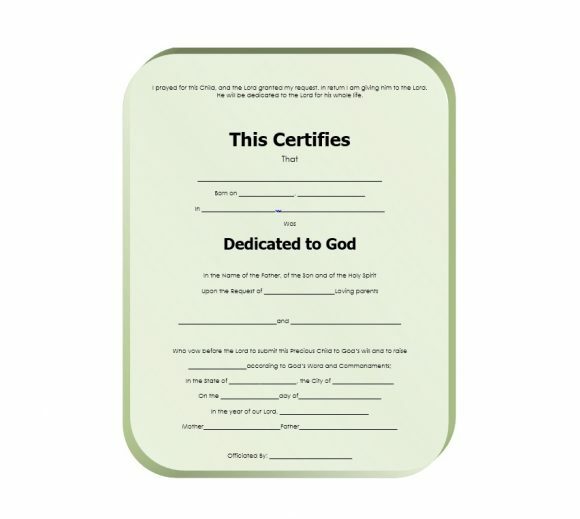 Make the vows you intend to keep as the child’s parent as well as those you make to witnesses in your community. 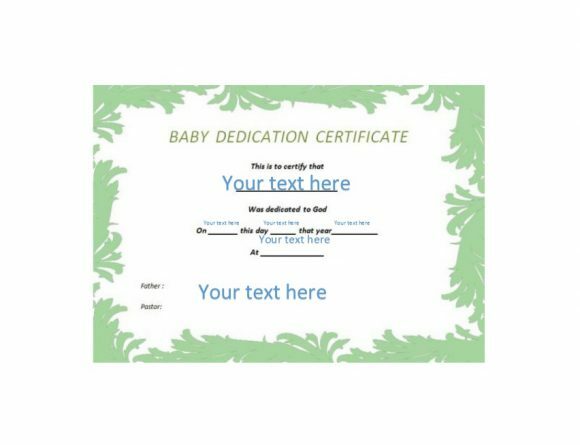 You need to think about the baby dedication certificate wording carefully. The ceremony, which is religious in nature, includes that promise. You commit to bring your child up in faith and acknowledge that the child is God’s gift to you. 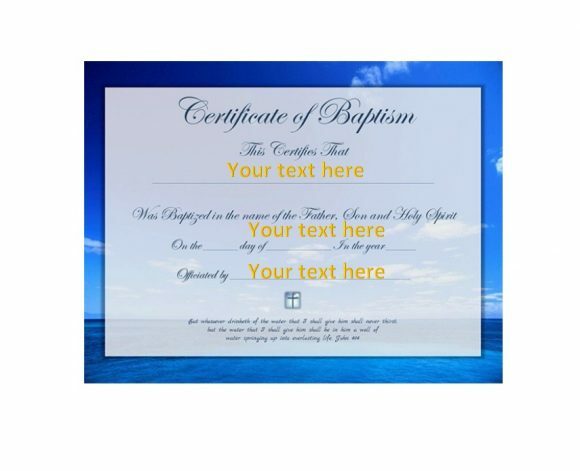 Like baptisms, dedications can also involve godparents. They can serve as witnesses in the ceremony. They can also have their own promises to make for the child. 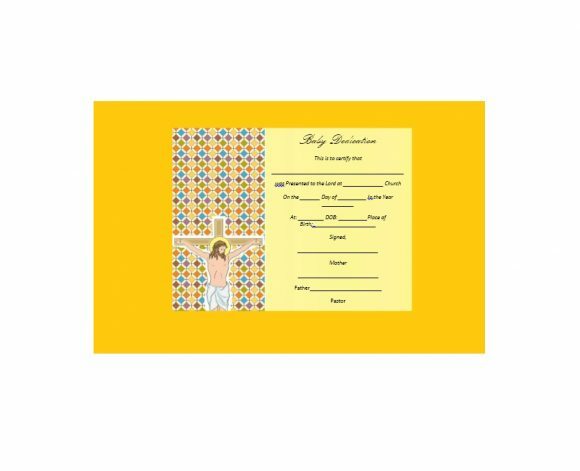 Godparents can assist parents in raising the child. 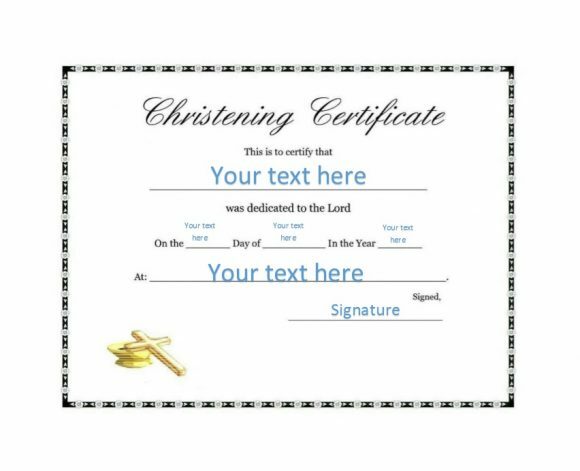 You should also sign the certificate to confirm all the promises you made. 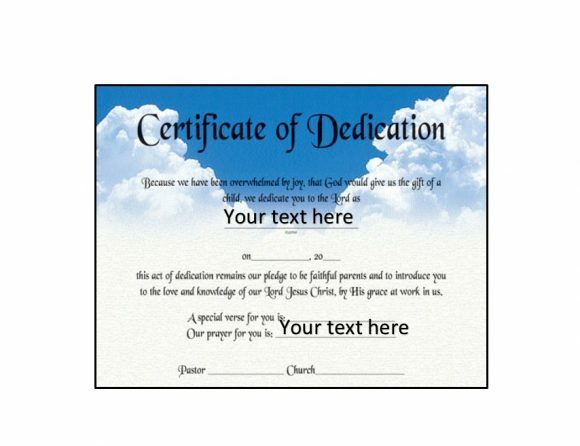 Be sure all signatures are there to make the certificate more complete and formal. 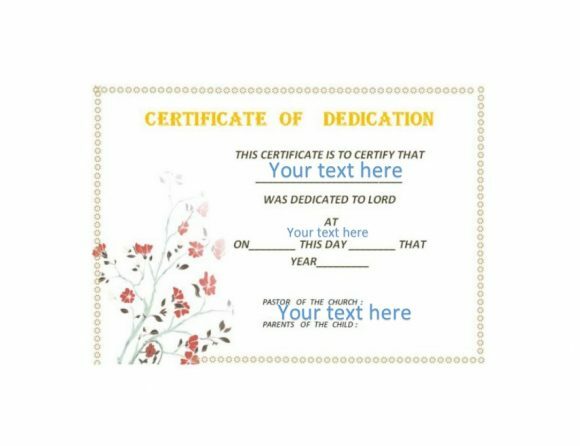 If not using a template, decorate your certificate with borders. It makes it more presentable. There are many computer applications that you can use for this. If you want, you may leave some space for a seal. 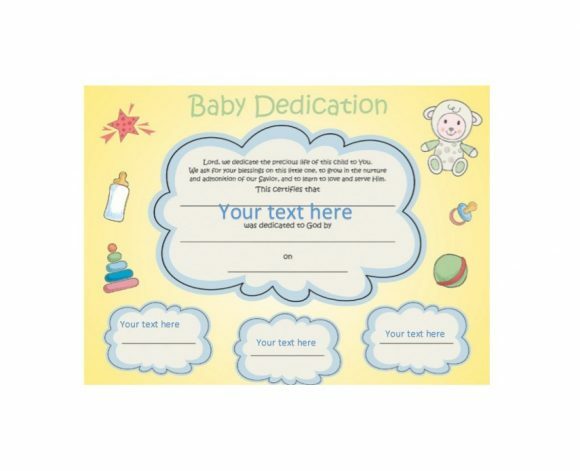 You can decorate the bottom of baby dedication certificate template with baby’s handprints or footprints. Wouldn’t that be amazing? The dedication is not only an acknowledgment of God’s sovereignty on the child. It includes the Moms and the Dads as well. When parents make the dedication, they are asking God and the community for the grace and wisdom in carrying out their responsibilities. They are also hoping that the child will one day come to trust Jesus Christ as his Lord and Savior. Also, pray for the forgiveness of sins. 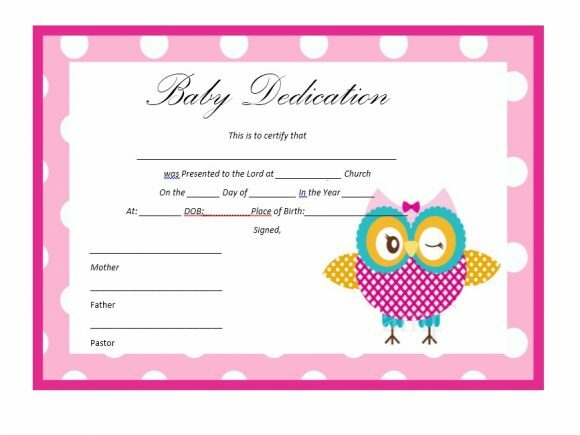 Here are some suggestions to make your baby dedication more memorable. Invite all your family and friends. This should be a special occasion and should involve all those you love, your family and friends. After you have met with the pastor regards to date and time.Make calls or write to your loved ones so they can have ample time to make the necessary arrangements. Select a cute outfit for your baby. What better time than to make your babies shine? Pick an outfit that would make your child the belle of the ball.Make sure it is comfortable and not too flashy. After all, it is a special day for the child, for the parents and for the Lord. 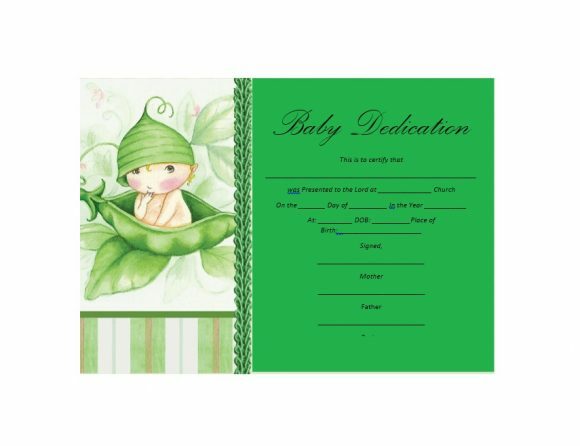 Write something for your baby like a poem or a letter.This certainly would be a way to draw attention and may even turn out to be the best part of the ceremony. 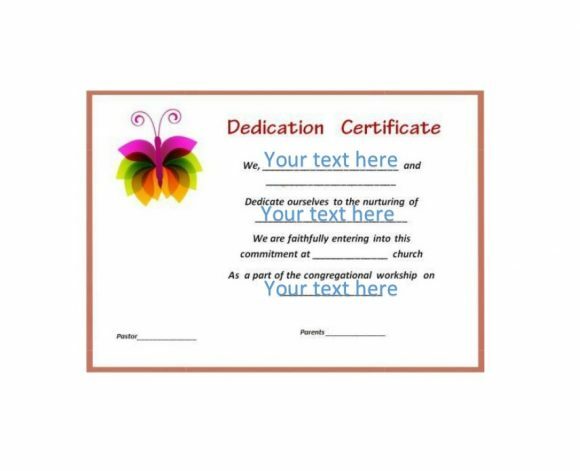 It gives the parents the opportunity to express their feelings, hopes, and dreams.Write the lines on a nice piece of stationary and read it during the dedication service. 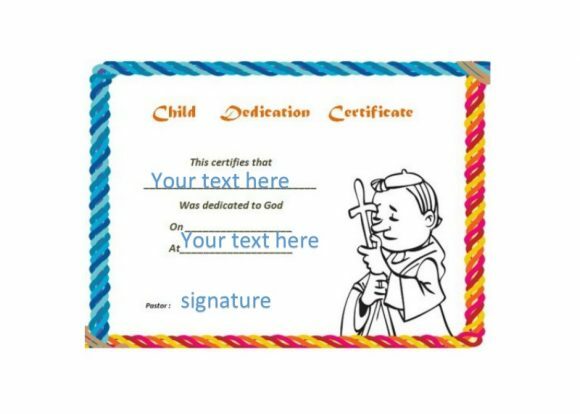 Then keep this paper in a safe place and share it with your child when he/she can understand. Make it a family affair. 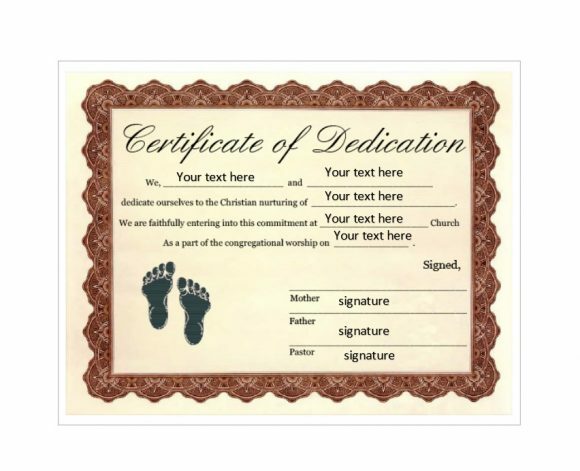 If the pastor is accommodating, it would be nice to involve family members in the ceremony. You can request members to share their thoughts about the rite. Just to make them special, invite grandparents to share too. Use a camera to record all the memories. Capture this special ceremony in pictures and videos. Designate a good relative to get great shots. Do group shots to remember everybody present. It would be worthwhile to share these memorabilia with the child in later years. Choose a great playlist for the event. Music will always set the mood for a celebration. Choose songs that can touch everybody’s heart and if a good singer can render them, the entire better! Create a program. Just to get organized, make a program with the service’s order. Include things that are important to the celebration. 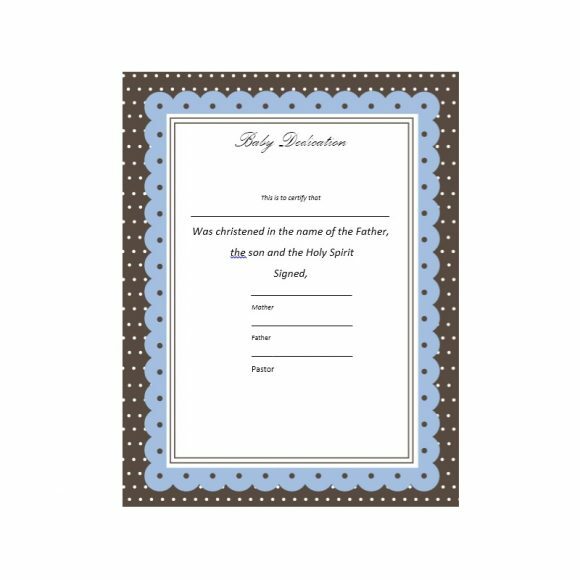 Make a baby dedication certificate to give to your baby. 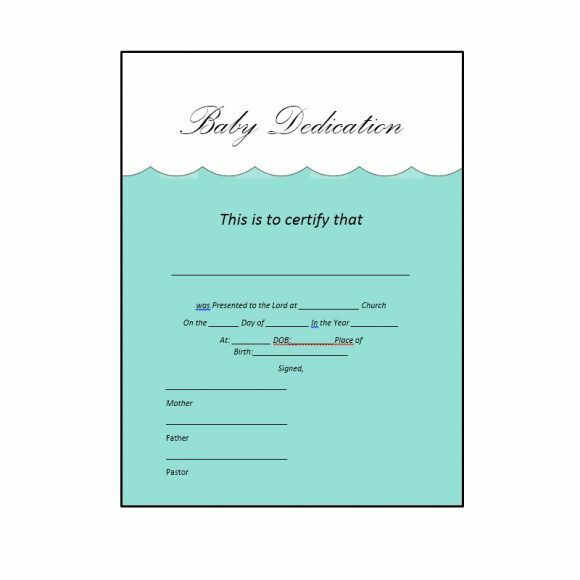 The baby dedication certificate makes the affair complete. Usually, the pastor can provide you one after the rite. If not, you can always purchase a good one at a Christian bookstore. This will make a great addition to your baby book. Or frame it for everyone to see. Enhance the celebration with food. For the finale, prepare a family meal. 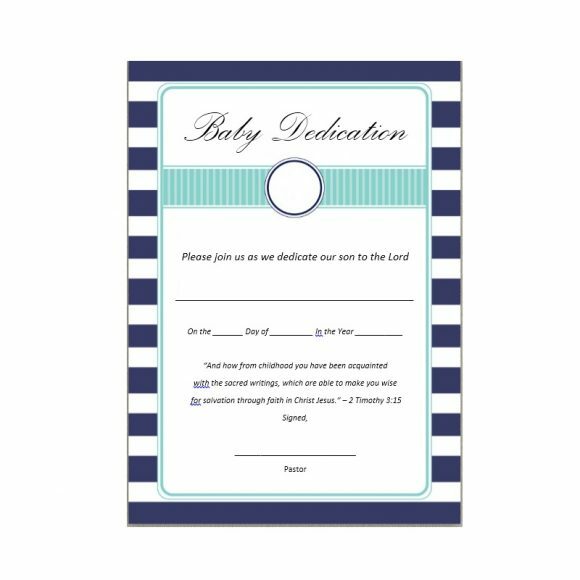 Baby dedication can be a great time to socialize, especially with your most loved ones. You can even inform your guest. it is a potluck session, to unburden you with too many recipes.